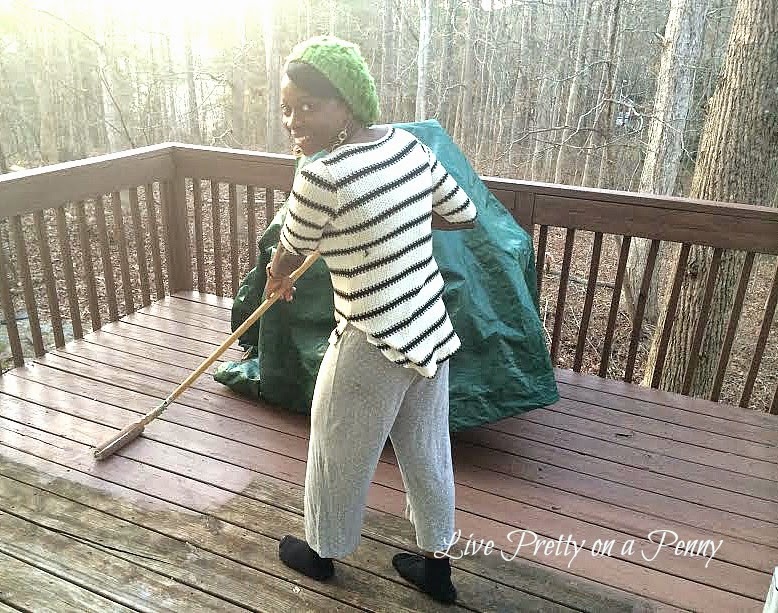 Upon accepting the Home Depot Patio Style Challenge, we knew staining the deck was first on our list. When we thought about the process of staining our own deck, we became a bit overwhelmed, as it seemed like a lot of work. Way to much work for two working full time people…with a toddler. However, after we examined it more, we realized that there really wasn’t that much work to do, since one of the hardest parts is removing past stain and ours had never been stained before! It had already been pressure washed so what we figured it needed was a good sanding. 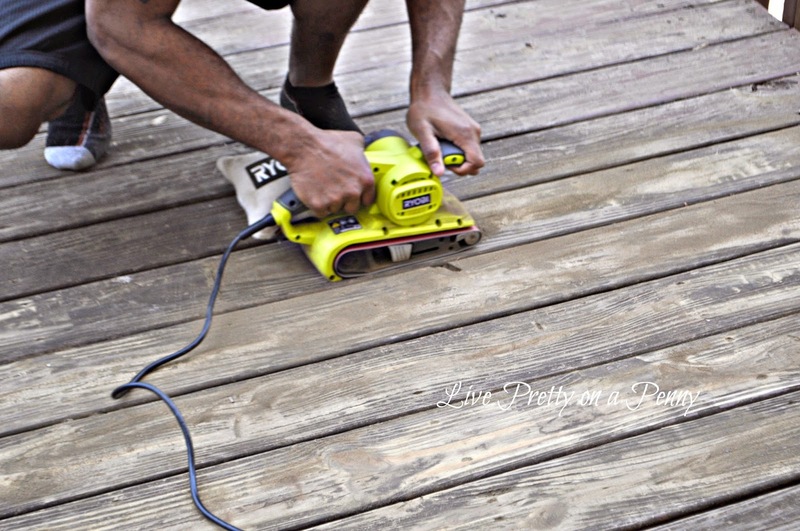 Using the Ryobi Belt Sander, we sanded the deck to rough up the surface. After sanding and sweeping away the dust, we began staining the deck in the direction of the wood grain. We stained using a roller brush and long attachment. For the rails, we just used a short handle paint brush. After we applied several coats of stain, allowing it to dry for an hour in between, we let it sit and cure for several days before placing any furniture on it. For the stain to properly cure, I would suggest several days of temperatures above 60 degrees and definitely no rain! I took lots of pictures, but some were washed out because it was so sunny. So this one shows the color the best. We stained using Thompson’s Water Seal in Solid Acorn Brown, which worked very well. 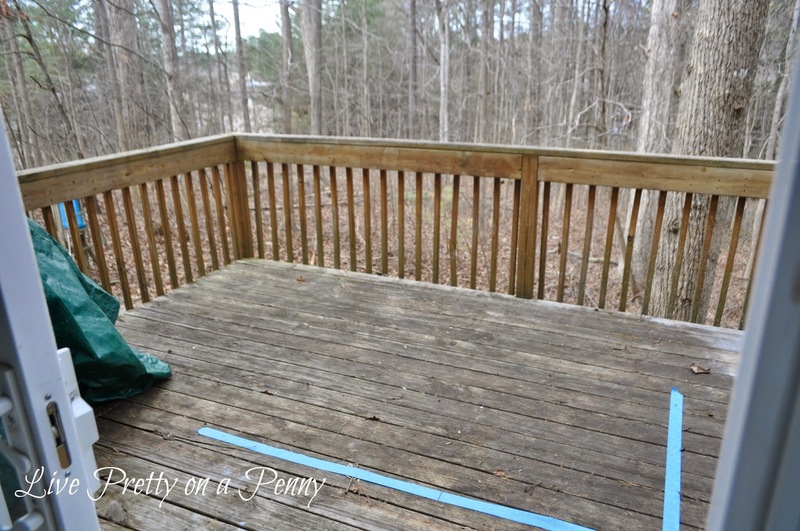 To see how the deck looks after the Patio Style Challenge reveal, click here. This is a beautiful stain color! You guys get a great job. Everything looks great! It looks like it covered really well, I plan on using the same product on our fence. 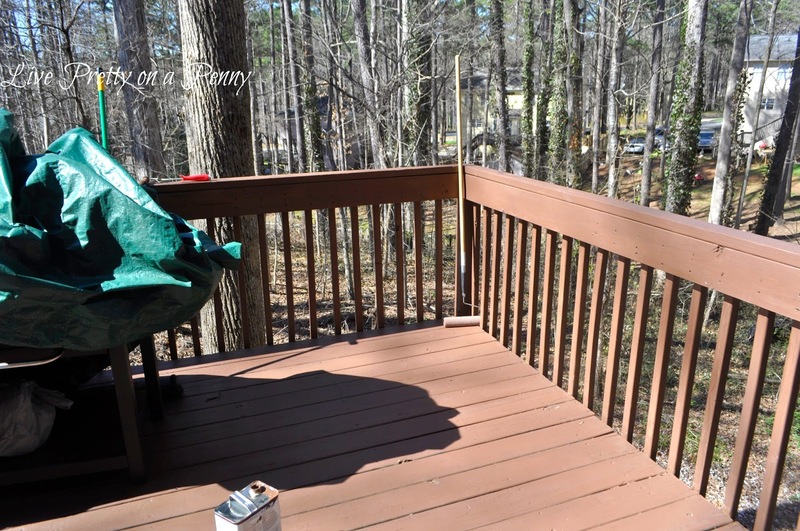 We used Rustoleum Restore on our deck and porch. I'm really hoping over the years it holds up as well as the stain you used. Love the new look it gave your deck.